When is Cleeng paywall more useful than DaCast paywall ? DaCast provides an english-based, white label paywall integrated into our player. It supports USD and EUR. It covers most of the situation but, if you need to provide your viewers with a specific currency or/and a specific language, then Cleeng paywall is a very qualified paywall provider. What is the advantage of using Cleeng with DaCast ? DaCast is directly integrated in Cleen platform allowing you to set up your DaCast live channel with a Cleen paywall in few minutes. How to do pay per view streaming with DaCast and Cleeng ? Add your event details in the fields that appear here, then click next. Then, set a price, or multiple prices. Click next when you’re done. 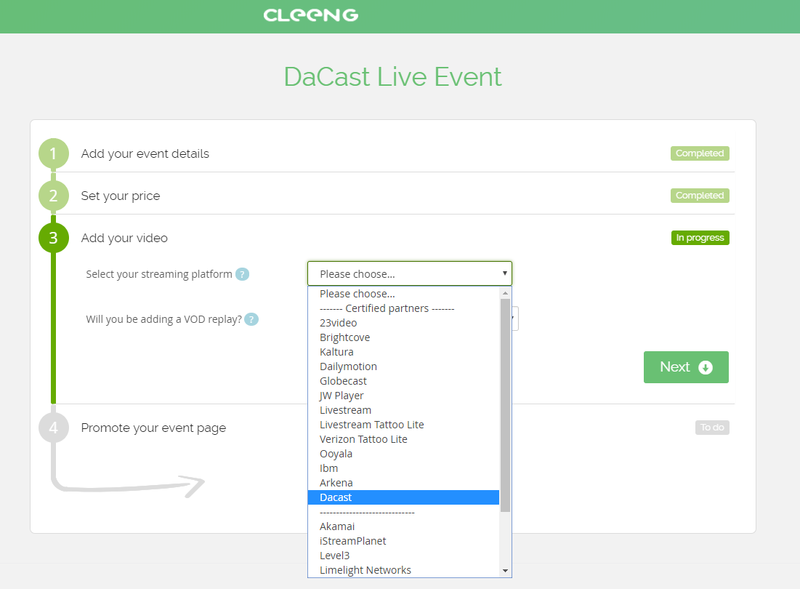 Select DaCast in the dropdown menu “Streaming Platform.” Fill in other details, then click next when you’re done. Complete promotion information if necessary, then click done. Now, click on your live event to open the event page in the Cleeng dashboard. Select “Embed event” in the top bar. Copy the embed code. This will allow you to embed your DaCast live stream with the Cleeng paywall onto any website.